Qualcomm is the company of mobile chipset which makes some great mid-range mobile chipsets. The brand name of mobile chipset is Snapdragon. The first Snapdragon product to be made available to consumer device manufacturers was the QSD8250, which was released in November 2007. It included the first 1 GHz processor for mobile phones. Qualcomm introduced its “Krait” microarchitecture in the second generation of Snapdragon SoCs in 2011, allowing each processor core to adjust its speed based on the device’s needs. At the 2013 Consumer Electronics Show, Qualcomm introduced the first of the Snapdragon 800 series and renamed prior models as the 200, 400 and 600 series. Several new iterations have been introduced since, such as the Snapdragon 805, 810, 615 and 410. Qualcomm re-branded its modem products under the Snapdragon name in December 2014. As of 2018, ASUS, HP and Lenovo have begun selling laptops with Snapdragon-based CPUs running Windows 10 under the name “Always Connected PCs”, marking an entry into the PC market for Qualcomm and the ARM architecture. QUALCOMM has been launched various version of Snapdragon Processor where Snapdragon 712 is the latest version of Snapdragon 636. Here is given complete review between Snapdragon 636 vs Snapdragon 712. The Snapdragon 712 is based on 10 NM FinFet It is a 64 Bit Octa-Core processor. It has 8 kryo 360 core. the clock speed is upto 2.3 GHz. The GPU of 712 is Qulacomm Andreno 616. 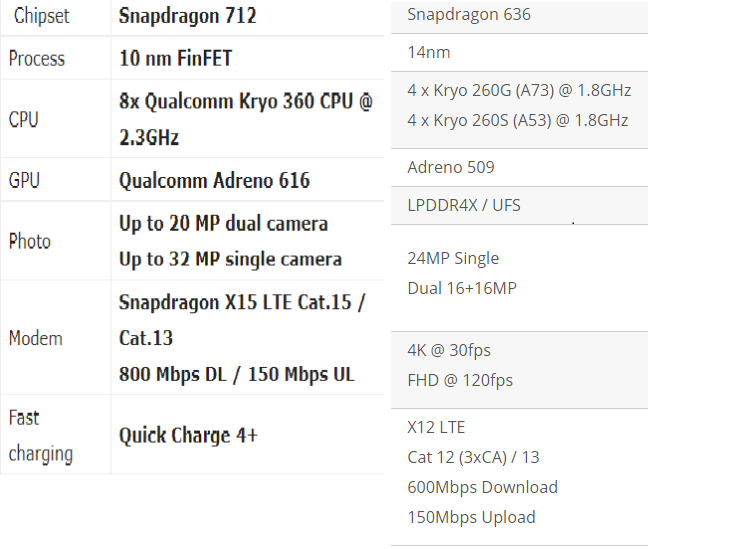 The Snapdragon 636 is based on 14 NM FinFet It is a 64 Bit Octa-Core processor. It has 8 kryo 260 core. The clock speed is upto 1.8 GHz. The Gpu of 636 is Qulacomm Adreno 509. The Snapdragon 636 supports up to 16 MP dual camera up to 24 Mp single camera. It has qulacomm Spectra 160 image signal processor,2ximage signal prcess (ISP). 14 bit qualcomm. The features of 636 is zero shutter Log , Hybrid Autofocus, Optical Zoom. The feature of 712 is Rec 2020 color gamut video capture, ultra HD video capture upto 10 bit color deppth video capture. Snapdragon 712 supports up to ultra HD Video Capture upto 10 bit color depth video capture. Its codec support is h.265( HEVC), H.264. (AVC), VP8, Vp9. Snapdragon 636 suports upto 4k ultra HD vide capture @ 30 FPS, Upto 1080 p video @ 120 FPS. Its codec support is H.265(HEVC), H.264 (AVC), Vp8, Vp9. Snapdragon 636 maximum on- Device Display support FHD+ (18.9) and Maximum External Display Support upto 1080p. Snapdragon 712 maximum on Device Display support Quad HD+, HDRI0,3360×1440 and maximum External Display Support up to 4K. Its HDR 10 bit color depth, Rec 2020 color gamut. Snapdragon 712 supports Qulacomm True Wireless, stereo Plus technology, Qualcomm Broadcast Audio technology, Qualcomm Aqstic audio technology, Qualcomm aptX, audio technology. Its playback support is aptX classic, aptX HD. Snapdragon 636 supports Qualcomm Aqstic audio technology, Qualcomm aptx audio technology. Its playback support is aptX Classic, aptX HD. The Snapdragon 636 has the support for dual-channel LPDDR4x with up to 8GB size arrangement and supports maximum RAM frequency of 1.8GHz. It also has the support for eMMC5.1 and UFS2.1 type internal storages. The Snapdragon 712 can support LPDDR4X RAM up to 8GB. it supports both UFS2.1/EMMC5.1 based storage. Snapdragon 712 has X15 LTE modem that can support LTE Cat 15 to give a peak Download Speed up to 800 Mbps. It uses Cat 13 with a peal speed up to 150 Mbps for uploading. It also Support for other options like Dual 4G Volte, Dual Band Wifi, Blue Tooth 5.0, USB 3.1, Type-C, NFC, GPS . It has support for QUALCOMM Quick charge 4+ . The conclusion of Qualcomm Snapdragon 712 vs Snapdragon 636 comparison is a very complicated. First of all talking about CPU Performance, Snapdragon 712 CPU performance is much better than Snapdragon 636. Then in terms of GPU 712 has Adreno 616 whereas 636 has Adreno 509. So the GPU of Snapdragon 712 is the best. The 636 is based on the 14 NM process where as Snapdragon 712 porcess based on 10 NM chipset. The narrow FinFet process means more power efficiency so 712 is the best. Lastly talking about camera support, the 636 has support for up to 16 MP dual camera and 24 Mp Single camera sensor where as 712 has support up to 20 MP Dual camera and upto 32 MP single camera sensor. So the 712 camera support is good. That’s overall comparison between Qualcomm Snapdragon 636 vs Snapdragon 712. Which is better for you please share your thought in the comment box?